Time for another vegan weekly meal plan. But first, another week in review. Last week's plan was fairly successful. We had to make a couple of changes to the schedule, but for the most part the plan ensured that we made decent meals. Yesterday's scheduled meal was Roasted Fall Vegetables and Lentil Salad, but my son's basketball game was right around dinner time so we postponed that particular meal until today (pictured above). The family had lasagna (from frozen) instead and I had a quick fried rice. Going back to Monday, here's a picture of our Express Curried Lentils. She ain't pretty, but trust me this recipe is tasty. And the combo of cauliflower and lentils makes it good and healthy. I served it over a rice and quinoa blend. My husband and I both declared the recipe a "keeper." Tuesday was Taco Tuesday...tacos with all the fixin's. Enough said. Here's Wednesday's Pasta Primavera, made with vegan parmesan. The recipe, by Giada De Laurentiis, calls for farfalle, but I used a kamut spaghettini. This one is well worth making too. Especially if you are dreaming of spring. Of course, I couldn't get yellow squash so I used extra zucchini. With Thursday came another change of plans. My husband and son went skiing and ate at the lodge. So, no spaghetti and tofu balls here. Couldn't be bothered. I quickly baked tofu triangles in teriyaki sauce. I made a rice mix out of a box and noodles from a box. The rice was not bad, the so-called "Pad Thai" noodles horrible. The combo also made for a pale looking plate of food. I definitely should have thrown some broccoli on there! Friday called for more easy veggie burgers and the like. Nothing too demanding or exciting. I accidentally bought a lot of mushrooms so I'm going to roast them with other veggies. From The Garden of Vegan. I posted this recipe from Martha Stewart Living's Meatless cookbook, but I have yet to try it. The express curried lentils sounds delicious to me and it has ingredients that I love. Great menu plan Jo. Those roasted vegetables look delicious. Mmmm pasta primavera. One of my all time faves! Those look amazing! We might just have to given them a try. Ooh, I would love that lentil salad- looks amazing. Thanks for linking up, Joann! I have seen some vegan goodies on your blog Natalie. ;) I hope you can do the whole week. I would love to hear/read about it! I always love seeing what you're making! You have the best menus!! The veg and lentil salad looks amazing! Off to check out your links. The ginger, potato and cauliflower toss sounds like something I might have to try! Yum! 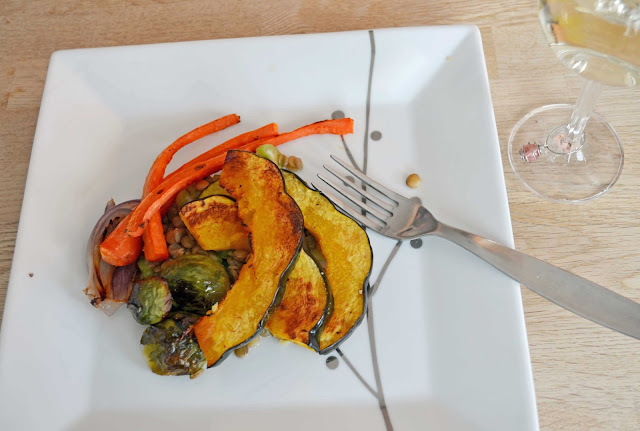 The roasted vegetables look very tasty,especially that acorn squash resting on the top.